New: We now have a conference room available for meetings including a television, phone, and Wi-Fi. Situated in the Endless Mountains of Pennsylvania, Keystone Mountain Park Trust has been preserved as a private non-profit scenic conservation trust for those who appreciate the beauty and tranquility of this wilderness area in a non-drinking, non-smoking atmosphere. We are conveniently located just 3 miles south of Eagles Mere village, a resort destination since its founding in the late 1800s. 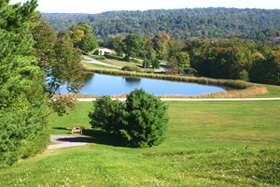 Guests have been visiting the mountain top at Keystone Mountain Park Trust for over 70 years to enjoy the unique panoramic views of the Endless Mountains. We are a family-oriented facility that welcomes children of all ages. Accommodations for overnight stays are available throughout the year. Group facilities including the restored Barn and Celestial Views Chapel offer an idyllic setting for church retreats, weddings and family gatherings.